Hans Summers explained me that I never transmitted at 100 or 50 mW, the only thing the power setting does is to change the transmit message, but not the transmitter power because this is what you do with the potentiometer setting the bias current. So I changed the schedule back to one transmission every 10 minutes at 200 mW as it was before. Serial cable connectors installed, the D-sub cables and connectors have become a collectors item. Frequency oven oscillator now at 26998907 Hz. There is always some outgassing of volatile elements in the first three months until a stable reference frequency is found. Reference OCXO frequency is now at 26998903 Hz, GPS lock remains on and I changed the beacon to transmit at several power levels. A WSPR transmission lasts two minutes, we start at the whole hour and repeat every 10th minute the sequence: 23dBm, 20dBm and 17dBm, next we calibrate for 3 mintues and we wait one minute. The beacon frequency is now locked to GPS. After a few calibrations (for which I gave it 120 seconds, the adjustment is performed directly after the transmit intervals) the reference oscillator frequency changed from 26998886 Hz to the new value of 26998900 Hz. If you run WSJT-X with a disciplined clock then you should find that I’m transmitting a WSPR signal at 14097125 Hz. My manual tuning method with DCF77 and the two Russian time transmitters was apparently within 14 Hz of the reference frequency. The beacon runs on an intermittent schedule since I have no possibility to remotely control the hardware. The beacon transmit interval is now set to 10 minutes, its frequency remains 14097.125 kHz, every hour the beacon will transmit at 0, 10, .. 50 minutes. You can receive the beacon with any shortwave receiver, but to decode the WSPR signal you will need software that decodes audio of your receiver. I’m using the WSJT-X tool from Princeton university, but you will probably find many applications. Check WSPRNET for the latest developments. If you want to see how other stations receive the beacon then click here. A WSPR application normally decodes what it receives, but it can also upload its results to the WSPR server that maintains a publicly accessible list. You can sort on various fields in this list, one is for instance the kilometer per milliWatt performance, or just the distance, time and date and so on. For the 20m meter band the beacon output is 300 mW, but the bandwidth is only 6Hz. The spectral density becomes 51.4 mW/Hz which is equivalent to 154 Watt for 3kHz bandwidth. 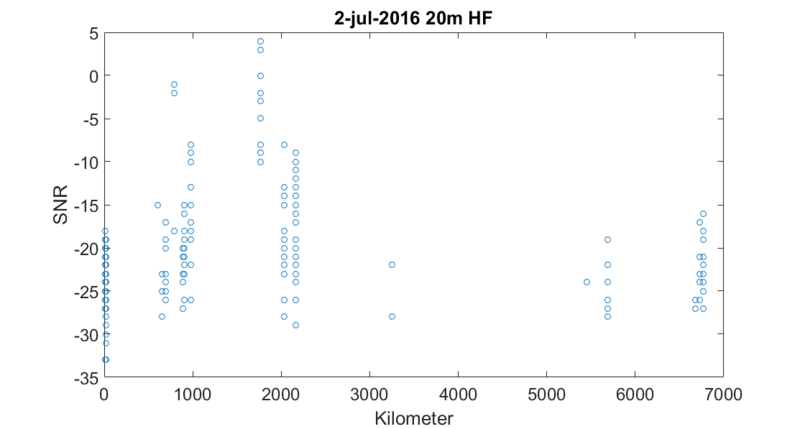 This explains why you can receive the beacon at several thousand kilometer depending on the HF propagation. This morning I tested my low pass filters for 40, 20 and 10 meter, the peak to peak voltage is respectively 12.3V, 11.5V and 7V, in other words, the transmit output varies by band. I checked the PA bias current and the harmonic distortion of the transmitter on the scope. The relayed band filter selector still does not work and I have to check this. Found a 9V DC adapter, this is fine. I’m impressed by the GPS receiver, in particular its sensitivity, at the moment it is inside the house and it receives more than 10 satellites. There is no need for an outdoor antenna. The case arrived, and I connected it to the HF antenna today, the beacon should output 200 mW output or 23 dBm, but I measured 11.1 Volt peak to peak across a 50 Ohm dummy load, (0.7*11.1/2)^2/50 = 300 mWatt which is slightly more, but the software says it is 23 dBm. GPS receiver is on top, the heat problem I had with the power supply is also gone with this case, mounted the LM7805 on a small print with two capacitors on the bottom of the black aluminum case. There is plenty of area to dissipate the heat, after many hours it was still ok. This is what the WSPR map showed over the last few hours. And as you can see, the rapporteurs appear every 800 to 1000 km, there seems to be some ideal angle and height at which the signal reflects to the ionosphere. Beyond 3000 km there is a station distribution problem, from 5000 km onward you get to see to US stations. This is an easy way to make a 50 Ohm dummy load, which is also good for measuring the output of the beacon. Currently I’m constructing a beacon which promises to generate a 200 mW WSPR signal. The beacon comes from qrp-labs where I ordered the ultimate 3s kit, the photos below show it running on the workbench, the frequency is set to 14097.125 kHz which was found after tuning the reference frequency variable in the beacon and measuring the spectrum with a calibrated software defined receiver (SDR) which is the earlier mentioned airspy on this blog and on QRZ dot com. Below is what I get to see on the SDR which was calibrated relative to DCF77 on 77.5 kHz and two Russian time standards on 4996 and 9996 kHz. Next you measure the output of the beacon on a nearby antenna, and you modify the reference frequency on the beacon until you get the correct frequency on the SDR. On the next photo you can see that the WSPR modulation is a 4 tone FSK signal as is discussed here, we are looking at the 19th overtone which is still visible probably because there is no metal case yet around the beacon. The higher the overtone the better, you need a weak enough signal to see this. Here are some other parts that belong to the kit, on left you find a GPS receiver, in the middle you have a relay band filter selector (the low pass filters are designed for 80, 40, 30 , 20, 15 and 10 meter) and on the right you find the standard synthesizer that I used for initial testing. It is left over so I will probably use it for making an antenna analyzer. Right now I’m waiting for the case to arrive, as soon as it is there I will connect the beacon to an antenna. Here you see the WSPR transmitter in combination with the GPS receiver that came with the kit. I already had the frequency and time adjusted, but this gadget does it for free. Here you see how it performs a calibration after a 2 minute transmit window. I found something very similar with the SDR calibration method, actually, you will see that this value will stay for a very long time within the 1e-9 relative to this value, please read my ovenized crystal oscillator experiment that I published in 2014. One concern is already the power supply, it receives 13.8Volt now and the LM7805 regulates it down to 5Volt while the transmitter and GPS receiver draw up to 500 mA. (13.8-5)/2=4.4W is a lot for the LM7805 to dissipate, maybe I should start looking for a larger cooler (which is now a piece of copper, 3 by 5 cm). A temperature of 52C is still acceptable for the LM7805 but it comes with a warning sticker on the device for anyone handling it.